The appearance varies widely, because there are so many subspecies of the Greek Tortoise. Color can range from olive with dark spots in the middle of each scute to a golden variety that is almost all yellow in color. In all subspecies, the male is smaller than the female. Its colors are yellow-gold to dark brown or black. Flecks, borders, rays and spots on the shell produce a pattern reminiscent of a Greek mosaic, hence the name “Greek tortoise”. One to three raised scales, spurs or tubercles are located at either side of the tail on each thigh. The head is blunt with large eyes and the arms exhibit large scales and thick, powerful claws. Housing Greek tortoises outdoors in a naturalistic pen is always best. During the warmer part of the year, they can be kept in spacious enclosures that are well planted with edible vegetation and receive plenty of time in natural, full sun. Indoors, the construction of a “tortoise table” will suit the needs of these creatures well. A 1 x 2 meters (3 x 6 feet) unit made of ply wood will suffice for a single adult and up to a pair of adults. Wood is always recommended over plastic or glass so that the tortoises cannot see out. This way they will learn their boundaries and it will lessen their attempts to escape. If the space is available, always go larger in size. This allows for a more natural behavior cycle and reduces stress especially from territorial or aggressive specimens. Males being housed together may pose a problem by fighting relentlessly, especially when females are present. It’s important to give the tortoises as much room as possible because they could be spending months on end indoors, until the weather outside is once appropriate for outdoor keeping again. Half logs, upside down tupperware with an entrance hole cut in, drift wood and cork bark make for excellent hide aways. These will be used frequently by the occupants. Larger rubbermaid containers turned upside down with an entrance hole cut into it can be made into a “humid hide” for young Greek tortoises to help keep up with smooth shell growth. For outdoors housing In areas where weather isn’t very reliable, I recommend using cold frames or mini greenhouses for the tortoises to enter. The best possible substrates for housing Greek tortoises indoors are a 50/50 mix of top soil and play sand, cypress mulch and aspen wood shavings. When using aspen it is very important to make sure the tortoises stay hydrated because it tends to be very dry. Rabbit pellets will suffice but do not hold humidity well and mold will grow quickly in soiled areas. Cedar and pine bedding are an absolute NO, as they are toxic to tortoises. As always, natural sunlight should be utilized whenever possible and the tortoises fully benefit in many ways from being exposed to it. When housing them inside, proper lighting is essential for keeping them healthy. Many options are available to us today such as daylight spot bulbs, infrared heat bulbs, fluorescent tube lighting and ceramic heat emitters. Mercury vapor bulbs which provide both UVA and UVB are a personal favorite of mine. A 100-150 watt vapor bulb is installed on one end only of the indoor unit and this makes for a perfect basking area. It also lights up the enclosure nicely. The opposite end should remain cool. You can also use a regular spot light for the basking area so long as it reaches a temperature of 35-37 °C (95-100 °F). In this case, a fluorescent UVB emitting bulb will need to be installed as well. The ambient room temperature should remain between 24 and 29 °C (75 and 85 °F). Many Greek tortoises derive from extremely arid habitats while others are found in more temperate locations. Regardless of their origin, they all need to stay hydrated. A shallow water dish should be available to them at all times for drinking and soaking and should be changed frequently. Tortoises defecate in water so keeping the supply clean is a must. They also appreciate occasional misting of their environment and may see it as “rain”. This prompts them to empty their bowels and drink. When raising hatchlings, a humidity level of between 65 and 70% is appropriate. This can be achieved by spraying down the enclosure every other day with warm water. A water dish in combination with a substrate that retains humidity well such as 50/50 top soil-play sand mix or cypress mulch does the trick as well. By keeping the babies well hydrated and at a sufficient humidity level, they will grow smoothly and keep good weight. Greek tortoises spend much of their time gazing on edible landscape. For this reason, it is an excellent and healthy idea to offer weeds such as Dandelion, clover, plantain, hawksbit, cat’s ear, wild strawberry, and thistle. When these items are not available like during the winter months, they can be replaced by dried, bagged organic herbs. These can be found online. Store bought greens like collards, mustards, kale and turnip can be offered sparingly. Commercial diets such as Mazuri are excellent for helping the tortoises maintain good weight but again should be offered only in moderation. Calcium supplements in the form of cuttle-bone are wonderful additions to their diet. The tortoises will gladly nibble on them as they feel the need and take in appropriate amounts. As with any turtle or tortoise, Greeks do not like to be held. By nature, these tortoises are low to the ground therefore; they should be picked up when absolutely necessary. Soaks, cleaning of the enclosure and health checks are reasons for handling. While they tend to become very responsive to their keepers and will approach you for food, they should not be over-handled by any means. They are an easy-going, friendly and interactive species but like all reptiles, should never be overly stressed. These tortoises are susceptible to respiratory infections so it is crucial that you understand which type of Greek tortoise you have. Those that are native to more arid areas cannot handle wet or overly humid conditions. No tortoise of any age should be subjected to drafts. Make sure the enclosure is not near a window or door when indoors. Outdoors the use of greenhouses, cold frames and outdoor lighting systems can really help keep the tortoises healthy in parts of the world where weather and temperatures are not all that reliable. 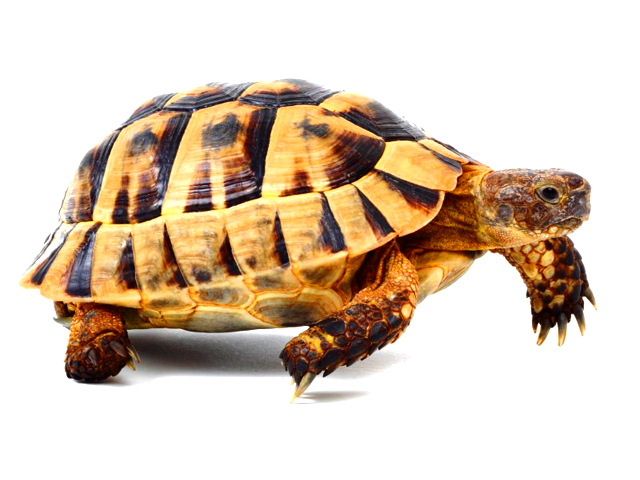 Never house Greek tortoises with any other species of tortoise. The Testudo graeca species complex has been known to carry viruses and diseases such as herpes and/or rana virus. They may never show symptoms of these conditions but can easily pass them onto other species which will inevitably cause death. While Greek tortoises may be able to carry these deadly diseases/viruses and not perish, other types such as Hermann’s or Leopard tortoises will quickly fall victim to them and die. Always use caution and practice sanitation when handling various animals within one collection. Anti-bacterial soaps and hand washes should always be on hand.